Sand Sifting Gobies plow through the tank substrate, sifting/straining algae, detritus and uneaten food from the sand. This not only removes unwanted nitrate producing substances, but it also stirs and aerates the substrate (very important for deep sand beds), releasing toxic gases. This type of fish needs fairly small grain sand so they can sift it through their gills without damaging the membranes in their gills. When setting up your aquarium it is important to plan ahead when choosing the right substrate. 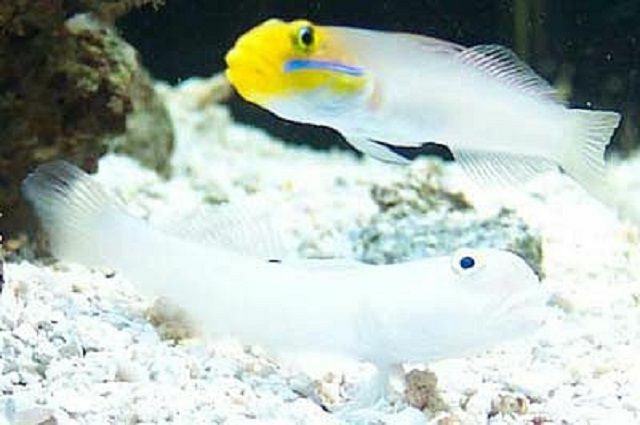 Fine-grained medium (0.5-1.7 mm grain size or sugar-sized sand) is best for sand sifting fish such as Gobies. The Diamond Watchman Goby (Valenciennea puellaris) (also commonly referred to as the Pretty Prawn, Maiden, Orange Spotted Diamond, Orange-dashed, or Orangespotted Sleeper Goby) digs shallow burrows in the substrate for refuge, which keeps the substrate well oxygenated. Although a goby that is rarely aggressive towards other fishes, it may fight with other same and similar species gobies. This Goby is best kept singly or in mated pairs. The Diamond Watchman Goby (Valencienna puellaris)is very persistent in digging its burrows in just the wrong places and may cause decorations, live rock formations and corals to topple. The Engineer Goby (Pholidichthys leucotaenia) (also commonly referred to as the Convict Goby) requires a sand substrate where it can make burrows. It needs a peaceful tank and lots of hiding places. Small groups or pairs tend to do better but may need to be introduced to the tank together. The Orangemarked Goby (Amblygobius ​decussatus) (also known as the Orange-Lined Goby) sifts sand as it plows its way through the substrate, keeping the substrate oxygenated. It is rarely aggressive towards other fish, however, it is territorial, and will fight with others of the same species unless they are a mated pair. The Sleeper Banded Goby (Amblygobius phalaena) (also known as the Brownbarred Goby and Bullet Goby) uses shallow burrows in the substrate as a refuge, keeping the substrate well oxygenated. It is rarely aggressive towards other fish, however, it is territorial, and will fight with others of the same species unless they are a mated pair. Like most Gobies, it should be fed live and frozen fares, such as vitamin enriched brine and mysis shrimp, other prepared foods for carnivores, as well as live black worms. The Sleeper Blue Dot Goby (Valenciennea sexguttata) (also known as the Ladder Glider, Ladder Goby, or Sixspot Sleeper Goby) should be fed live and frozen fares, such as vitamin enriched brine and mysis shrimp, other prepared foods for carnivores, as well as live black worms. Also known as the Twostripe Goby, the Sleeper Railway Glider Goby (Valenciennea helsdingeni) digs shallow tunnels in the substrate as a refuge, keeping the substrate well oxygenated. It is rarely aggressive towards other fish, however, it is territorial, and will fight with others of the same species unless they are a mated pair. The Sleeper Striped Goby (Valenciennea longipinnis) stirs the sand as it sifts through it, straining out food. This Goby is a carnivore, therefore its diet should include a variety of live and frozen brine shrimp, mysis shrimp, live black worms, and prepared foods for carnivores. 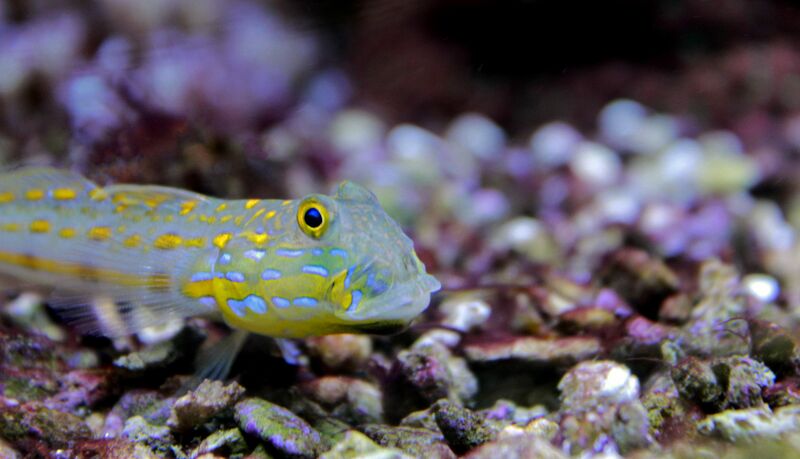 The Tiger Watchman Goby (Valenciennea wardii) (also known as the Ward's Sleeper, Ward's Tiger, or Tiger Sleeper Goby) is a favorite among reef tank enthusiasts. The Tiger Watchman Goby stirs the sand as it sifts through it, straining out food. Its diet should include a variety of live and frozen brine shrimp, mysis shrimp, live black worms, and prepared foods for carnivores. The head and body of the Two Spot Goby (Signigobius biocellatus) (also referred to as the Twinspot Goby, Signal Goby, or Crabeye Goby)are white splattered with orange markings. Its erect dorsal fins are distinctly marked by eyespots. Is the Yellowtail Coris Wrasse Fish Right for Your Aquarium? Should You Add Camelback Shrimp to Your Aquarium? Should You Get an Orange Shoulder Tang for Your Aquarium? Is Having a Mantis Shrimp In Your Aquarium Considered a Pest or a Pet?